ect the hope of the Gospel in today’s world. This Pastoral Plan is a response to the hopes, concerns and issues expressed by people. It builds on an effective parish, pastoral area and diocesan infrastructure; increased appetite for ongoing training; and the commitment of clergy and people evident in the parishes throughout our diocese. 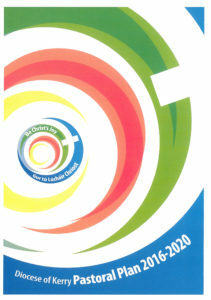 Our parishes are alive and deeply relevant in 21st century Ireland. The challenge now is to proclaim the joy of the Gospel in a way that touches peoples’ hearts and lives in these ever-changing times. Be a catalyst for compassion and justice. Proclaim the Good News of Jesus Christ joyfully through witness, community, worship and service. To be a welcoming compassionate faith community, with Christ at its centre, calling forth the gifts of all for the good of the world to the glory of God.